Is this the new Vauxhall Astra estate? | What Car? Is this the new Vauxhall Astra estate? We sometimes use computer-generated images to show the design of new cars before they're officially unveiled, but how accurate are such images? This image shows what the estate version of the new Astra could look like, but you've only got a week to wait to see how close our artist has got with his interpretation of the car. Although the Astra estate makes its debut at the end of September at the Paris motor show, the company is to reveal the first official pictures of the car next week. Well revisit our computer images then to compare the two. 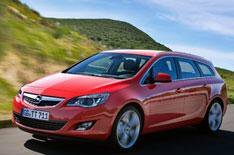 The new Astra estate will go on sale at the end of this year or early in 2011 for around 16,700.